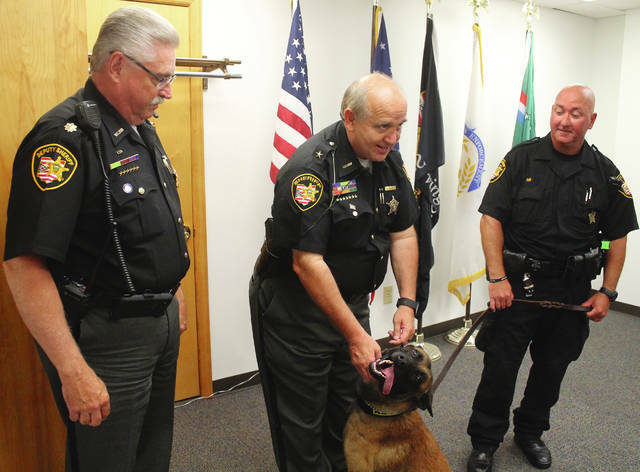 Anna Bolton | Greene County News Auco, the newest K-9 on duty with the Greene County Sheriff’s Office, is a 2-and-a-half-year-old Belgian Malinois. Deputy Jamie Coe is Auco’s handler. The two initially completed 6 weeks of training together and continue to train weekly. Maj. Rick Bowman, Sheriff Gene Fischer and Deputy Jamie Coe introduce Auco to the public June 22. XENIA — The Greene County Sheriff’s Office introduced its newest crime fighter to the public June 22. A two-and-a-half-year-old Belgian Malinois — Auco — has already begun his law enforcement career on county roads. Alongside his handler, Deputy Jamie Coe, Auco is a dual-purpose K-9 that does both narcotics work and apprehension work. “We can do everything from the drugs to tracking for people to tracking for articles. Once we find somebody that needs apprehended and we don’t want to send in officers, then we send Auco and he’ll apprehend them for us,” Coe said. 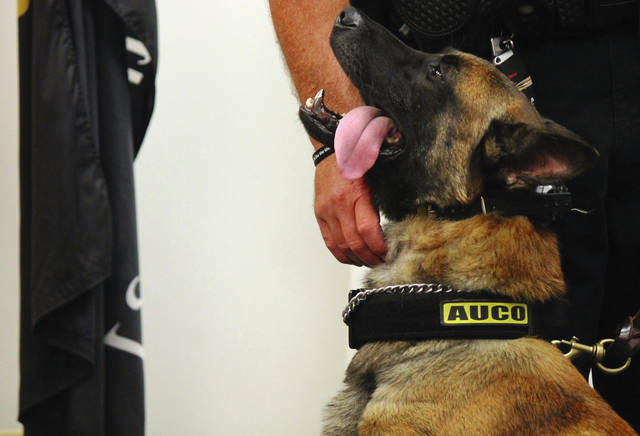 Since joining the K-9 team, Auco has been successful in his duties and has already been responsible for many arrests and seizures. Originally from Holland, Auco went through a 5-week course of training with a master trainer, and then met Coe for another 6-week course of training. They continue to train together every Wednesday. While Auco works the day shift, Benny, the office’s second K-9, works nights. K-9 Royretired in September 2017 at age 10 after nine years of service. Fischer and Maj. Rick Bowman said Xenia tow companies, private individuals and businesses, Hill’s Science Diet, local veterinarians and community members have donated food, treats, medicines and vet services to the K-9 program. Bowman also thanked Nancy Hazlett, a Xenia resident who led the first campaign in 2016 to purchase protective vests for the dogs when theirs expired. Auco gave Hazlett a quick face lick at the ceremony — on his way to greeting every guest that walked in. Fischer also said his cars have begun carrying Narcan for dogs, which handlers are trained to use if the dog comes in contact with fentanyl or heroin. 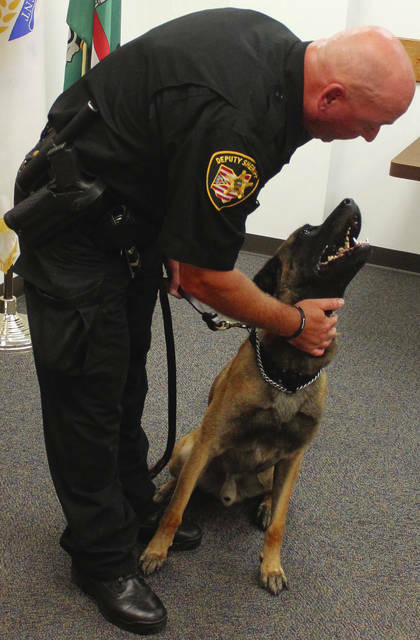 https://www.beavercreeknewscurrent.com/wp-content/uploads/sites/49/2018/06/web1_Auco.jpgAnna Bolton | Greene County News Auco, the newest K-9 on duty with the Greene County Sheriff’s Office, is a 2-and-a-half-year-old Belgian Malinois. https://www.beavercreeknewscurrent.com/wp-content/uploads/sites/49/2018/06/web1_Handler.jpgDeputy Jamie Coe is Auco’s handler. The two initially completed 6 weeks of training together and continue to train weekly. https://www.beavercreeknewscurrent.com/wp-content/uploads/sites/49/2018/06/web1_Smiling.jpgMaj. Rick Bowman, Sheriff Gene Fischer and Deputy Jamie Coe introduce Auco to the public June 22.